Every so often a book comes along that shakes up established wisdom and forces us to rethink our viewpoints and beliefs. 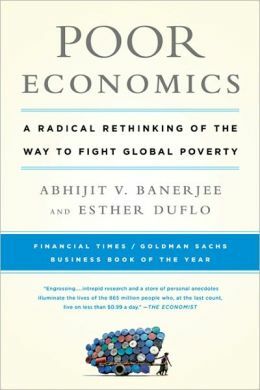 The latest such book to cross my desk is Poor Economics: A Radical Rethinking of the Way to Fight Global Poverty by Abhijit V. Banerjee and Esther Duflo, published by publicaffairs in 2011. This is a worthy read for anyone interested in development theory, policy, practice and economics. The authors are professors of Economics at the Massachusetts Institute of Technology (MIT) and co-founded the Abdul Latif Jameel Poverty Action Lab (J-PAL). Their book reports on the effectiveness of solutions to global poverty using an evidence-based randomized control trial approach. Banerjee and Duflo argue that many anti-poverty policies have failed over the years because of an inadequate understanding of poverty. They conclude that the battle against poverty can be won, but it will take patience, careful thinking and a willingness to learn from evidence. Why do the poor (those living on less than 99 cents a day) need to borrow in order to save? Why do the poor miss out on free life-saving immunizations but pay for drugs that they do not need? Why do the poor start many businesses but do not grow any of them? 1. Do Conditional Cash Transfers Affect Electoral Behavior? Evidence from a Randomized Experiment in Mexico, by Ana L. De La O. The evidence comes from the pioneering Progresa, the original Mexican conditional cash transfer (CCT) program (since repackaged as Oportunidades). This CCT program led to a 7% increase in turnout and a 16% increase in the incumbent vote share, with clear implications for politicians in areas where CCT programs reach a large percentage of voters. 2 School Subsidies for the Poor: Evaluating the Mexican Progresa Poverty Program, by T. Paul Schultz of Yale University (August 2001). This study considered how a CCT program affected school enrollment. The CCT program increased enrollment in school in grades 3 through 9, with the increase often greater for girls than boys. The cumulative effect was estimated to add 0.66 years to the baseline level of 6.80 years of schooling. Microenterprises are often unable to access suitable financing, even though they are responsible for employing a large portion of the total workforce. This experiment, which gave cash and in-kind grants to small retail firms, demonstrated that this additional capital generated large increases in profits, with the effects concentrated on those firms which were more financially constrained. The estimated return to capital was found to be at least 20 to 33 percent per month, three to five times higher than market interest rates. Banerjee and Duflo’s positive message is that poverty can indeed be alleviated, but we need to take one small measurable step at a time with constant evaluation of whether or not particular policies are successful, based on evidence, not just on belief systems. “Poor Economics: A Radical Rethinking of the Way to Fight Global Poverty” deserves its place of honor alongside other such genuine classics as E.F. Schumaker’s “Small Is Beautiful: A Study of Economics As If People Mattered” (1973). It is a must-read for geographers, regardless of your political persuasion.